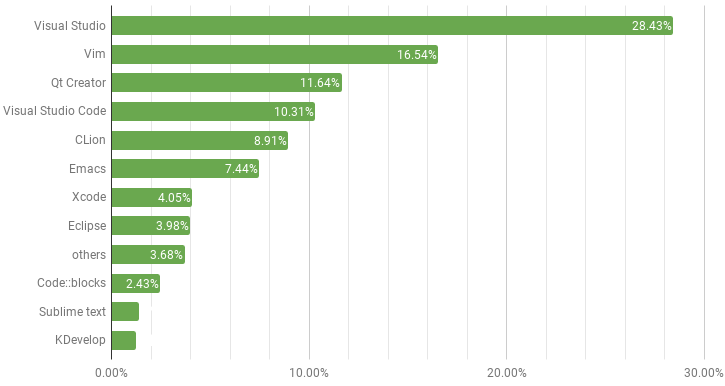 These are the results of a research study to determine which are the most used C/C++ IDEs in 2018. 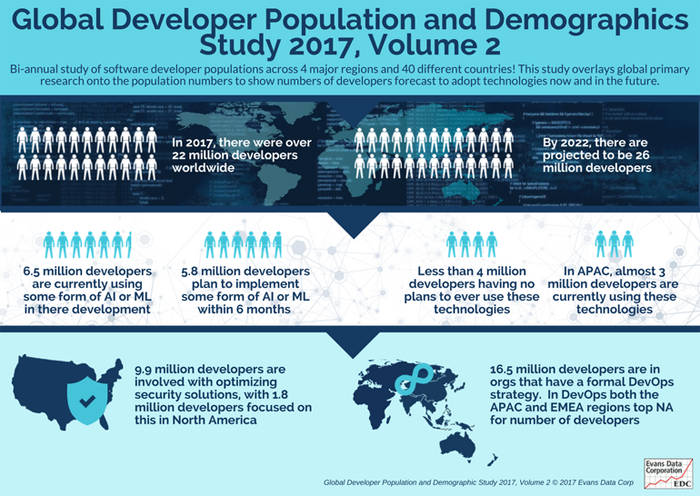 They include the estimated market share for the top IDEs, but also the estimated number of users and of C/C++ developers in the world. What are the most used C/C++ IDEs? I wanted to find out what are the most popular C/C++ IDE, so I decided to run several polls and to collect data to get some answers. As you might have noticed, the second place is hold by Vim, technically a text editor, but many developers use it with (several) plugins as a proper IDE. 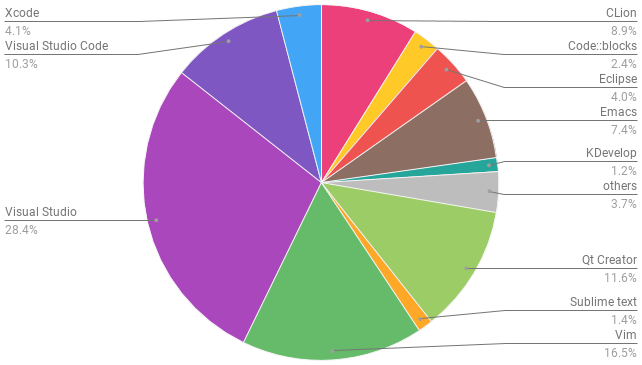 In this chart “others” includes all the entries with less than 1% of votes. Some notable IDEs in this group are C++Builder, CodeLite and NetBeans, whereas some text editors are Atom and Notepad++. Another way to see the same numbers is using a bar chart, which I believe is easier to read when comparing more than 4-5 options. 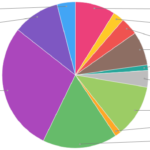 Whatever the chart we use, It’s clear that the most used C/C++ IDE is Visual Studio, which holds more market share than the 2 following alternatives. Visual Studio covers almost more market share than the following 3 IDEs and Microsoft controls over 50% of the market with Visual Studio and Visual Studio Code. Basically 2 out of 3 people (mostly) use a single IDE for their C/C++ development. The starting point of this estimate is assuming the total number of software developers is at least 22 millions. That number comes from a study of Evans Data which considers the 40 different countries in 2017. 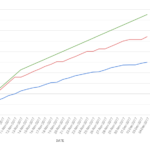 Using the TIOBE index from 2017, the estimate of C and C++ developers is 3-3.7M. The problem with the TIOBE index is that it’s more an internet popularity index rather than a proper market research. It’s fair to consider it as a lower bound for this estimate. At the end of 2016, a senior manager of Microsoft said that there are over 1.5M C++ developers using Visual Studio. I am assuming that number includes C developers too. 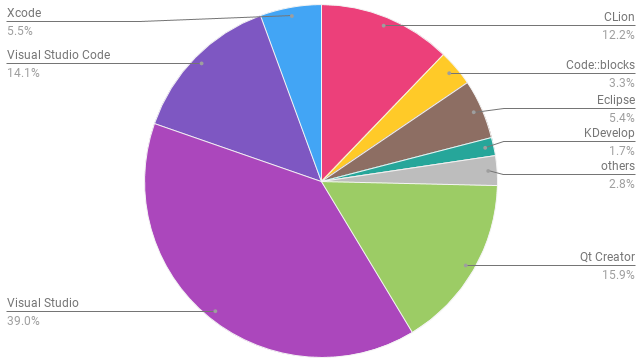 Projecting the market share from my poll gives a total of 5.3M of C/C++ developers. A research conducted by Jetbrains in 2015 estimated the number of C and C++ developers to be about 6.3M. For sure there is some overlapping between C and C++ developers, but it’s safe to assume 6M as upper bound for this estimate. Putting all together I believe it’s fair to say that the number of C/C++ developers in the world is around 5.1M. Keep in mind that these are not the numbers of total users for each tool, but only the number of people who use them as C/C++ IDEs. How good are these numbers? The polls I have been running collected (valid) entries from 1860 voters. Which means that statistically, the margin of error of the poll is around 2.99% with a confidence of 99%. That basically means the results shouldn’t be too far from reality. Most of the data has been collected from the r/cpp community on Reddit. Other sources are Linkedin, Hacker News, Twitter and a couple of forums and Telegram groups dedicated to C++. 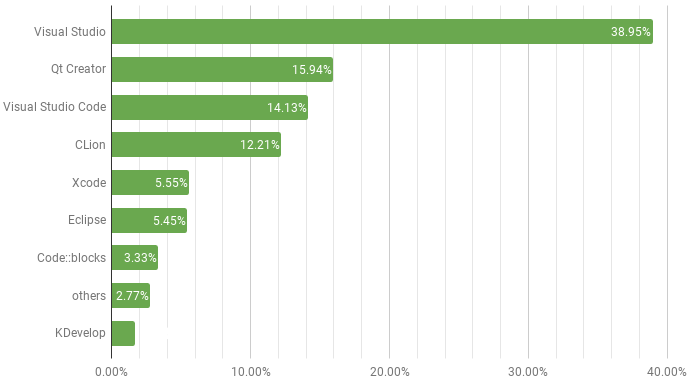 Clearly it would have been better having a more heterogeneous distribution of the sources, but on the other hand the majority of the votes should come from actual C/C++ developers and it should reflect the current market accurately enough. If you enjoyed this post don’t forget to subscribe to the blog newsletter to get notified of future ones. Nice summary, Davide. I hadn’t noticed that you could select more than one option. I certainly use Visual Studio, too; and, for my current job, I’m (also) using a modified version of Eclipse. My preference goes, in order, to Vim, then Visual Studio, then Eclipse (then Qt Creator). What’s your definition of a ‘text editor’? Yeah, would be really nice to know the definition since Microsoft positions VS Code as a “streamlined code editor” and FAQ says that “it leaves more complex workflows to fuller featured IDEs”. However in this article VS Code wasn’t excluded from IDEs-noly chart. A text editor is a generic program to edit text, not designed and/or developer for a particular purpose. I guess you are asking this because of VS Code. The reason for keeping VS Code in the results without editors is that VC Code is a code editor whereas Vim, emacs and others are “generic” text editors. Furthermore, it comes with built-in features that make it closer to an IDE rather than a text editor with plugins. I guess you could draw some line between these when you choose your words carefully.. but what’s the point exactly? Imo they are directly competing for the same market/users, are they not? Did you compare the data of the different sources against each other? If they differ too much it could be a sign of biased sources. It would be nice to know (maybe for a future poll) what kind of development was done on each IDE/text editor. I always used vim because it’s there already, it launches instantly and I can compile sort of fast (:wq gcc…etc). I only moved to CLion (and way before it to eclipse) when I had to code big projects in C/C++, in contrast to the small things I do with Vim. the data collected from other sources reflects the results from Reddit, at least for the top choices. What’s different it’s the percentage of minor IDEs, but that’s mostly noise (or lack of). I am definitely going to run a more detailed poll in the future as yours and many other questions are still unanswered. I never thought Visual studio so popular among c++ developers.Nice analytics. Out of interest, what plugins are people using in Vim that come remotely close to the advanced template refactoring capabilities of Eclipse CDT? Some of the clang plugins look like they’ll do autocomplete etc, but nothing that advanced. I use cscope for completion and jumping around. Not sure if there is any way to do actual IDE-style refactoring with Vim. I am planning a more accurate poll in the future. You might want to also ask what is the OS on which the IDE/editor is run. Interesting, but I suspect a bit tilted by respondent self-selection and skinning. Eclipse comes under the covers of many IDEs with other names, for example. IDE aside, MS Visual Studio has a major negative for some C developers when used with the MS compiler, which is support (or lack thereof) for C99 and C11 features, and lack of code awareness in the IDE for them. I suspect a large group of those using Visual Studio are not aware they they can download and use other environments. It may be more a measure of “who’s using windows” than “who likes visual studio”..